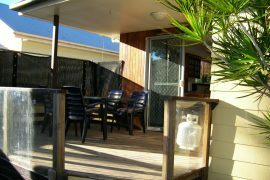 Our five holiday houses offer you the accommodation you have been looking for to have a memorable holiday in Wynnum Manly, Brisbane. 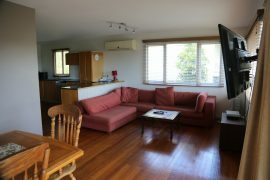 Clean beds and bathrooms, complete kitchen with dishwasher, refrigerator, oven, BBQ grill, Foxtel TV, laundry facilities and fast internet connection – these are just some of the amenities that make our holiday homes ideal for your next holiday vacation! 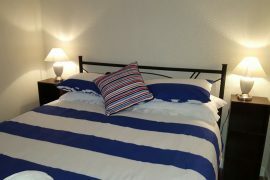 Our fully furnished holiday homes were designed to make your holiday vacation as convenient and enjoyable as possible. We have included modern-day amenities that will save you time and effort, so you can focus on enjoying the holidays. After all, how can you enjoy the holidays if you have a mountain-high pile of dishes and laundry to wash – gasp! – by hand? A Fun Holiday Vacation Awaits – Even Indoors! 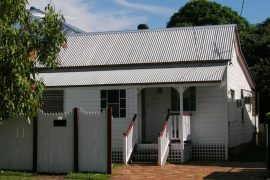 Boredom is unheard of in Wynnum Manly, and in our holiday homes. Should you wish to spend your holiday vacation indoors, our holiday homes have got your need for entertainment covered! Relax in our comfy lounge chairs while watching your favourite TV or movies from our premium TV equipped with movie and sports packages. Our fast unlimited internet will keep you connected with your family and friends back home, so you’ll never feel the fear of missing out! And of course, no Aussie holiday vacation (or leisure time, for that matter) is complete without the trusty BBQ grill! All of our homes include one. 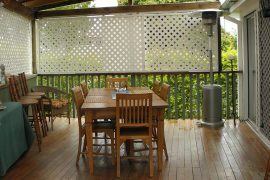 Most of our homes are also equipped with outdoor dining furniture for that authentic al fresco experience! Make your holiday vacation even more memorable by signing up for one (or all) of the outdoor adventures that the Brisbane bayside offers! Hit the man-made beach or dip in the pool to take a respite from the intense heat. Go cruising, fishing, kayaking or sailing – our community is perfect for water-lovers! You may also explore the nearby islands and significant historical sites to learn more about this area’s Aboriginal and colonial past. Celebrate the Holidays with Your Pets! Who said your furry friend must be left behind during the holidays? Four of our five holiday homes are pet-friendly! Depending on the holiday home, your pets may be allowed to either stay indoors or outdoors only. We’ll be more than glad to assist you should you have any questions about your pets’ accommodation. Holidays are a purr-fect time to bond with your pets! Choose from one of our pet-friendly homes to have a woofing wonderful holiday vacation! Enjoy a Safe and Secure Holiday! We take our guests’ holiday vacations seriously. Our holiday homes include a fully fenced backyard where you can roll around and play in with your pets in complete privacy and safety. We also have homes that come with off-street parking and extra high carport for your peace of mind. A key lockbox at the entrance of our holiday homes also provides additional security and convenience.